Got this from a colleague today. It’s a visual representation of the 200 most successful websites on the World Wide Web, ordered by category, proximity, success, popularity and perspective, and displayed in the manner of the London Underground map. A clickable online version can be found here. Noticed that one “line” on the map is dedicated entirely to China, an indication of how far the country has progressed since the days of its closed-door policy. 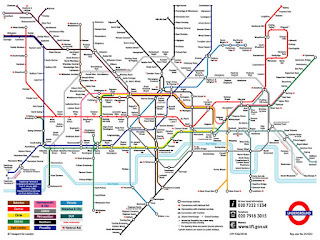 For those who are curious, here is the original London Underground map (more colloquially known as the Tube, in reference to the cylindrical shape of the system’s deep-bore tunnels).